What are Business Improvement Districts and what do they do? A Business Improvement District (BID) is an owner-financed district in which property owners make a collective contribution to public safety, maintenance, image and communications, and development. A BID is funded through special assessments levied on property owners within the defined district. A nonprofit organization, governed by a board of directors elected by district members, is created to manage and provide services in the district. Services provided may include public safety officers, street and sidewalk maintenance, streetscape improvements, park maintenance, marketing, parking management, business retention and recruitment, and various development projects. BID services supplement those already provided by the city. BIDs put public safety officers on the street in brightly colored uniforms, on foot, bike, and in vehicles. Serving as the eyes and ears of police, these officers give peace of mind to workers, residents and visitors. The officers act as ambassadors -- assisting visitors with directions and other information. BIDs clean storm drains, vacant lots, and debris filled alleys. Clean teams use a variety of tools such as graffiti removal; sidewalk pressure cleaning; sidewalk, alley, and gutter sweeping; trash and debris removal; and tree trimming to maintain a well-groomed appearance in the district. After a district has attained a highly managed environment, stubborn negative perceptions may linger. Marketing is an effective tool to tell the new positive story about a district's rejuvenation. Image and communications programs include: advertising, promotions, public relations, special events, web sites, map guides, trolley tours, destination signage, and festive banner programs. BIDs perform vital economic development services, providing broker support and implementing proactive business retention and recruitment programs. They also work with local agencies to resolve planning and development issues. The creation of BIDs in Alabama requires state legislation (thanks to the lack of home rule) and a local municipal ordinance. Downtown property owners established a BID in 1995. The City Action Partnership (CAP) was formed to keep the district clean and safe. City center promotional and developmental services are handled by Operation New Birmingham, which was instrumental in getting the BID established. Crime in the district dropped 59% from 1995 to 2005. The central downtown area is now safer than over-the-mountain suburban cities such as Mountain Brook, Homewood and Hoover. CAP services include security escorts to and from your car; stranded motorist assistance -- out of gas, dead battery, lock out, flat tire; directions and information; graffiti removal; cleanup and maintenance. When I was working in downtown Birmingham, a CAP officer jimmied my door one day after I locked my keys in the car. I was glad to see those guys on the job. In 2005 downtown property owners established a BID, which then formed the Downtown Mobile Alliance in 2006 to facilitate the work of the organization. Downtown Mobile Alliance services include creating more exposure for downtown redevelopment efforts and a clean and safe program. The Crewe of Stewards maintains the BID, conducting litter patrols, landscaping areas in the public right of way, removing graffiti and power washing sidewalks. The Crewe of Regents assists stranded motorists, provides directions and information, and escorts people to their cars. I'm not aware of any other BIDs in Alabama, but maybe there are some more in the works. Huntsville and Montgomery need to do something like this eventually. Is anyone aware of any additional Alabama BIDs in existence or in the works? Beyond CAP in downtown Birmingham, I was unfamiliar with any other BIDs in this state. There is a serious need for more of these to form in our cities across the state. I wish there were more BIDs in Birmingham. The BID in downtown Mobile is doing an awesome job. I agree that more need to be created. I think Spanish Fort on the eastern shore is trying to create one to help its bass pro shop development. I think Spanish Fort on the eastern shore is trying to create one to help its bass pro shop development. I'm not sure........but it might just be for that center. I think they are going to raise its sales taxes to 9%. 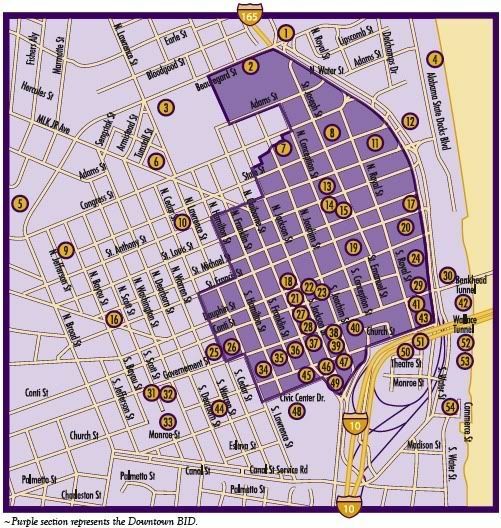 Here's a map of the BID in downtown Mobile. A legend for the numbered locations is available here: BID map.